Brenda was our amazing doula for our babies. With the first pregnancy and birth you don't know what to expect. She was there to walk us through the many questions. Just the reassurance of her knowledge in the last few weeks of pregnancy was invaluable. Brenda had a very calming presence which was critical to a hormonal pregnant woman, a woman in labor, and a husband watching his wife go through all this. While Brenda was so invaluable to me during that time, she was critical to my husband as well. She reassured him, allowed him to have guilt free breaks and took great care of both of us. Even with our 3rd and final baby, when I should have known how everything goes, Brenda was so helpful with the end of pregnancy and labor which went very differently than planned. Brenda was absolutely incredible throughout our entire pregnancy process. I honestly don't think we could have made it through labor and delivery without her! She has such a calming presence and knows exactly what to do and say to make you feel comfortable every step of the way. My husband and I highly recommend her and could not be happier for selecting her as our birth doula! ​The moment we met Brenda, we knew that her calming spirit and depth of knowledge made her the perfect doula for us. She has a passion for supporting natural hospital births, which is what we wanted, and her love for babies and early parenting oozes out of her. Brenda is always responsive and genuinely concerned about the well being of everyone in the family. She truly cares, and you can feel it every step of the way. Brenda creates a safe environment to work through fears, questions, and emotions in preparing for childbirth and adjusting to life with a newborn. We are so honored that Brenda played such a big role in welcoming both of our girls into our lives, and we felt comfortable and confident having her be part of such a sacred and private experience. Brenda knows so much, always has answers to questions, and felt like a counselor for us during times of uncertainty. I felt disappointment and regret after both births, that I couldn't accomplish my wish to have a natural birth without pain meds. Brenda helped soothe my disappointments and I never felt judged or pressured by her. I wish Brenda could be my doula forever, through all stages of parenting challenges and emotional swings! She's like a warm blanket -- you always feel like you can breathe a sigh of relief after getting her feedback and reassurance. Thank you, Brenda! For everything. Brenda was not my birthing doula--though I wish she had been. I know her calming, supportive, and non-judgmental presence would have been a boon because it truly was when we used her postpartum assistance. Her support and reassurance was so important, allowing me to adjust to motherhood and to bond with my baby without worrying about the things around the house I needed to do. She would care for the baby and prepare meals at the same time (I still can't do that), so that I could get a few hours of much-needed sleep. She would do a load of laundry or straighten up the house. Sometimes, if I wanted, she would just talk with me about how I was feeling or answer any questions I had. She provided instruction, emotional support and gentle encouragement (with no pressure) when there were issues with breastfeeding. I felt instantly comfortable with her. I didn't know anything about doulas or feel that I was the kind of person who would want or need one. But I cannot recommend Brenda enough. Assistance from family and friends can be wonderful but can sometimes come with its own stress and issues--generational disagreements about baby care, breastfeeding, etc. The kind of support Brenda provided is wonderfully freeing and stress-relieving. ​We had Brenda as a post-partum doula for our second child after we struggled with our first child with colic and sleep issues. We pre-emptively got a doula in anticipation of a repeat occurrence. I cannot put into words how wonderful she was. She was reassuring, caring, and so kind. She gave me words of encouragement, hugs, support - both mentally and physically. She helped with breastfeeding, and through illnesses I had. As my husband is gone often for work, she was a saving grace to me, to help me rest so I could be more present with my older child while still bonding with my son. She was amazing with our son. I cried after our last visit, as she had become like family. We are hoping to have one more child, and she will be my first phone call when we get pregnant again. She became like family, and I cannot recommend her more. We love Brenda. Can not say enough amazing things about Brenda and how she helped us through this new chapter of our lives. From the first moment we met her, she was so knowledgeable, open and calm. We immediately felt comfortable and at ease, which were among our priorities when looking for a doula. She was so committed to making sure our wishes for a birth plan were respected and kept a priority. Having her as a source of knowledge as well as a third party helping navigate patient-caregiver relationships, was so important. She was the perfect advocate during our labor at the hospital and making sure that we fully understood everything that was happening. Our birth plan didn't go as exactly as planned (our son just had his own agenda, of course LOL), but Brenda helped us stay positive, calm and focused. Her presence was just what we needed to make the whole experience the best day of our lives. We will always be grateful to have had Brenda by our side. It's crazy to think that at one time I had debated whether we needed a Doula in addition to the Bradley training we were planning to take, because now I can't imagine Brenda not being a part of our birth story. From our first meeting, my husband and I felt comfortable with Brenda. She is calm, caring and has a nice sense of humor, which was a perfect fit for us. The meetings we had in advance of my due date helped us all get to know each other and Brenda helped us develop and communicate our birth plan to our medical staff. Where her services really became invaluable to me though, were in the final few weeks leading up to delivery. She provided calm advice and support to all of my questions and concerns. It was important to me that I have a natural child birth with as few interventions as possible. As my due date passed with no indication of progress, my doctor urged me to schedule an induction. Brenda helped me formulate an alternative plan that the doctor was agreeable to and I went into labor naturally at 40 weeks, 6 days. Brenda joined us as I labored at home for several hours before going to the hospital. Having her there was a great comfort. I didn't have to remember everything I had learned in my child birth classes and I didn't have to second guess myself about whether I was in active labor or whether it was time to go to the hospital yet. I could just focus on the task at hand. Once at the hospital, she seemed to instinctively know what I needed without me asking for it.... a cool rag on my neck, ice chips, to be covered when I was cold and removing the blankets when I was hot. With her support, my husband and I welcomed a healthy 10 pound, 13 ounce baby boy! I wouldn't hesitate to recommend Brenda's services to loved ones & friends. I wasn't quite sure what to think when Doka suggested that we hire a doula to help with the birth of our first child - it just wasn't something that had ever occurred to me. I agreed to give it a try, but I had some misgivings. We had strong feelings about how we wanted to do certain things, and I didn't want someone who would try to boss us around or undercut what we wanted. Brenda put those fears to rest immediately. From day one, she was supportive, encouraging, and full of great advice. She took time to understand what we were hoping for in this experience, and she backed us up at every turn. ​It meant a lot that she met with us several times before the birth, so we were very comfortable with her as the big day approached. Having her with us added so much security to the process. 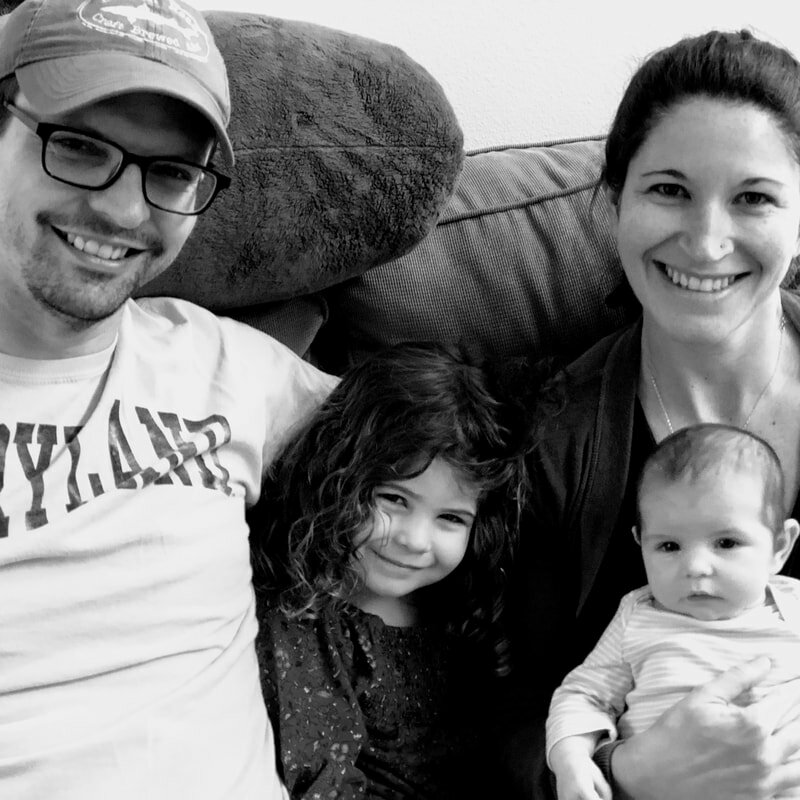 She was always able to provide insight on what was happening and what to do next, and I really felt like it took a lot of pressure off of me, allowing me to focus on encouragement and my wife's comfort. We had a fantastic birth experience, and Brenda was an incredibly important part of that. If we were ever to have another child, I would not hesitate to bring her back on the team. My husband and I wanted someone experienced, kind, and calming to help us during labor--and when my water broke nearly a month early, we were especially glad to have Brenda's strong yet serene presence in the delivery room! She kept me going and helped me stay steady, and when it was all over, we asked her to do some post-partum doula work for us too. Those months of night nursing literally saved my sanity--even just a night or two a week of good, uninterrupted sleep was huge. And I never worried when my daughter was with Brenda. I knew she was in the care of someone genuinely loving and very skilled with infants! I would highly recommend Brenda to anyone looking for help during or after giving birth. I will always be grateful to Brenda for guiding me through the birth of my child and providing vital assistance during his first few weeks when I didn't have a clue what I was doing. The hospital was extremely busy the day I went into labor and I ended up with a labor and delivery nurse who had to stay late, was in a bad mood about it, and felt free to let me know. Clearly, my desire for a natural birth was not important to the nurse. Brenda was an advocate for me and provided a calming presence in what was truthfully kind of a weird environment. As we don't have any family in Austin, we also used her post-partum doula services and she was fabulous. She helped me with feeding issues and just general babycare issues. I can't recommend her highly enough. After a very negative doula experience with our firstborn, my husband and I had decided not to hire a doula for the birth of our second child. When I was around 29 weeks pregnant we took a childbirth class at our OB’s office. The woman teaching the class was a doula and I remember sitting in the class feeling completely overwhelmed because she was offering so many tips, tricks and strategies to manage during labor but I knew my husband & I couldn’t do it on our own. I realized during that class that we had made a mistake by not hiring a doula. I spoke with the instructor after the class and she offered to ask around on our behalf to see if any doulas she knew were still available for a birth in 10-ish weeks. She mentioned that her favorite doula was a woman named Brenda and that Brenda would be her first choice. It was meant to be. Brenda was available. Brenda was exactly what we needed. She listened patiently while I poured my heart out about the negative birth experience we had with our firstborn. She has such a kind, gentle way about her that she immediately put us at ease. Even my husband, ever the skeptic, said he was glad that we hired her. She helped me articulate my fears for my upcoming birth and helped me figure out a way to change the narrative in my head in the weeks before the baby was born to something more positive. In the days leading up to the birth, there were several “false alarms” and she was available to us every second of the day, quick to respond to text messages and phone calls. If she didn’t hear from me she would check in to see how things were going. Throughout the birth itself, she was right by my side, cheering me on and helping me through every contraction. She was patient and understanding when I repeatedly told her I wanted an epidural, but ultimately she was the one who helped me achieve the natural birth I had always wanted. After our son was born she stayed in regular contact for the next several weeks and was a resource for us as I struggled with breastfeeding. I cannot say enough good things about my experience with Brenda Marlin and I would recommend her to anyone who wants to work with a doula. Brenda Marlin is amazing! She was my birthing doula and also THE person who kept my husband and I comfortable, calm, but also knowledgeable in what to expect moving forward during the entire pregnancy, labor, and postpartum. I was so lucky to have her by my side in the delivery room for one. If it weren't for her my labor wouldn't have gone as smoothly as it did. She really helped me in so many ways emotionally and physically and I thank her for that. When/if I get pregnant again I will def use her again. She knows her stuff and is there for you and your family 110%. ​Brenda is awesome! My husband and I can't imagine having delivered our baby without her reassuring presence. She provided guidance and support every step of the way--when exhaustion was setting in during the a.m. hours, Brenda was still on point...encouraging me into different labor positions to keep things progressing. Labor and delivery was the crux of our time together, but her home visits were helpful as well--Brenda is open to any questions even down to showing how to fit and use a baby sling. At our final home visit, Brenda explained baby sleep cycles in a clear way that has been so helpful to me and my daughter. My 5 week old goes right down for a nap now, and gets better and longer sleep than she did during our 'winging it' stage :). Thank you, Brenda--we are so grateful! Love Brenda! She was an amazing doula for our first born daughter. We interviewed 5 doulas who all came recommended and Brenda just really connected with us. I totally felt at ease and was so glad we had someone who has been there for over 100 births by our side for our first. It really let us be in the moment. She was there before and after and I consider her part of our family and heartily recommend her. Brenda was both our birth and postpartum doula. She was amazing. She makes an extra effort to make sure your wishes for your own birth plan are the top priority. As new parents, my husband and I really didn't know what to expect. But Brenda has such a soothing and calm presence, that on the day my baby girl came, I really had no worries. She was there to talk me thru anything that seemed scary during the birth, and knew just when to give my husband and I the alone time we needed. As a postpartum doula, she was fantastic. We actually called Brenda several times to come back and help us out (probably way longer past the birthday than we should have). But she was always up for helping us out. It was such a welcome relief. We love Brenda and will always be grateful for everything she's done for us. Brenda was an amazing part of our birth team! She was so helpful in the months leading up to birth as she met with us and helped us come up with our birth plan. I had a ton of questions, and she was so patient, calm and direct with me about what to expect. When it came time for the big day, she was with us every step of the way. Of course our birth didn't go as we had planned, but she was so helpful in helping us navigate what was to be our new plan. She was flexible and helped me feel empowered in my decisions. Once our birth shifted gears, she totally rolled with it and seemed to know exactly what I needed. Following birth, she was so kind and caring toward us when she came over for our postpartum visit. She again answered my myriad of questions and provided really helpful advice to help navigate our new chapter. I cannot recommend Brenda enough! She is calm, kind, caring, and professional while remaining warm. Brenda's warm, calm energy is what drew me to her from the moment I met her at the Keep Austin Doula'd meeting. Being first-time parents, my husband and I were looking for someone who could guide us through each stage of pregnancy, and who we could rely on to help us navigate the postpartum period. During labor, Brenda offered invaluable guidance allowing my husband and I to remain calm through each stage of labor. Brenda also helped us through multiple postpartum issues, including breastfeeding struggles, no-cry sleep techniques, and overall newborn parenting strategies. I have already recommended Brenda to a good friend, and I will continue to sing her praises as a birth and postpartum doula! ​Highly recommend! Our birth did not go as planned . Brenda was the calming rock we desperately needed. She is very intuitive, calm, and knows just what to do to make you comfortable. I think she kept a cold washcloth on my forehead for over 10 hours. Her presence made all the difference. Without her we would have been totally lost. Brenda is truly gifted! Thank you so much for everything! My only regret is not hiring her for postpartum care. My husband, Jason, and I hired Brenda to be our doula during the birth of our first daughter. I had been intrigued by the idea of a doula because I wanted to have the most support possible during, what I hoped would be, a natural childbirth. Convincing my husband that a doula was necessary proved challenging. He did not really understand the purpose of having a doula present at the birth but was supportive of my wishes. When we interviewed Brenda and heard that she had attended over 75+ births, we were impressed by her expansive knowledge and the fact she had experienced many different birthing scenarios. She emphasized having a plan but being open to change due to the unpredictable nature of childbirth. My first impressions of Brenda was that she was calm and kind. That is exactly what I was looking for. I was in labor for 34 hours and Brenda was with me for most of that time. I labored at home for about 12 hours. Brenda arrived at my house in the early hours of the morning because contractions had been getting closer together. Having Brenda at home with my was great because she gave me different positions I could labor in to help with the discomfort. My husband soon realized that Brenda was a great source of knowledge and encouragement. They did a great job of “tag teaming” so that someone was always by my side. Brenda was available but respected when Jason was being my support and did not jump in, unless invited or necessary. My labor seemed to stall at home but we eventually felt like I was far enough along to go to the hospital aboutnoon the next day. While at the hospital Brenda kept a calm atmosphere in the room. When my husband and I had questions about anything hospital related Brenda was there to answer our questions and sometimes calm us down when anxieties were running high. Because I was not progressing and my contractions were so intense and I was still not wanting to get an epidural, Brenda even reached out to her community of doulas to see if anyone had seen another case like mine. She wanted to respect my wishes of drug free birth by comforting me in other ways. My contractions became so close together and were lasting so long (sometimes 10-15 minutes) I would literally have only a moment of relief in between. At that point, Brenda was the biggest support to my husband. Not saying that she was not there for me but my husband was having such a difficult time watching the pain I was in and Brenda was there to encourage him. After 26 hours, I got an epidural, after discussing my labor with my husband, doctor, and Brenda. She was a vital part of my labor team. Her opinion was valued and support welcomed. My epidural helped with the pain. When I was finally able to start pushing Brenda was right next to me. She helped us welcome our daughter into the world. She gave us some private time as a family, right after the delivery, and came back in after. Brenda helped me breastfeed my daughter for the first time and then she went home so we could be together. Her experience was invaluable. My husband tells everyone to get a doula now…he is a believer! He has stated many times that Brenda was worth every penny and many more. I am so thankful for her support, encouragement, and wisdom. I could not have done it without her.